After six hockey-filled days at the Hershey Centre in Mississauga, OHL scouts and fans can walk away satisfied following several eye-opening performances and countless thrilling games between twenty of the top minor midget teams in Ontario and including several all-star teams from the USA. The Oakville Rangers persevered through suspensions, injuries and some early losses to defeat the always talented Toronto Marlboros team to capture the 2013 OHL Cup and many of these newly crowned champions will soon become top drafted OHL players at the April 6th OHL Priority Selection draft. With the opportunity to scout this showcase tournament filled with tremendous talent, I have compiled my notes from the week and came up with a list of players who impressed. In the first of a three part series, I break down the performances of players from seven participating teams in the 2013 OHL Cup Showcase Tournament, including top projected pick Travis Konecny of the Elgin-Middlesex Chiefs. Every year at the OHL Cup a player surfaces as a “surprise standout performer” and in recent tournaments, Boone Jenner (Oshawa Generals), Sean Monahan (Ottawa 67’s) and Andrew Abou-Assaly (Ottawa 67’s) emerged as those players. At the 2013 OHL Cup, Barrie Colt’s undersized forward JD Falconer put on a dominating show to lead all players in scoring with 10 goals (four better than the next best) and 13 points in five tournament games. Falconer’s performance is all the more impressive considering his biggest impact may have been on the defensive side of the puck. He was the main reason that his Colts’ squad was one of only two undefeated teams through round robin play. Scouts witnessed his intelligent hockey sense, admirable work ethic and leadership on each and every shift, qualities that should see his OHL draft stock rise substantially. On Friday, Falconer followed up a Thursday performance that witnessed him score a hat-trick and five points by posting four more goals and five points against the NOHA Stars earning back-to-back Player of the Game honours. Smilsky was one of the smallest players competing in the OHL Cup but his hockey sense, vision and ability to read opponents was extremely impressive. 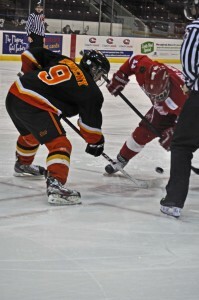 His puck skills are advanced as he exhibited crafty puck control and capitalized quickly on his offensive chances. Smilsky may operate in an undersized frame but he owns the confidence and intelligence of a savvy vet. Gerhart owns a canny ability to find the scoring areas on the ice like a true goal scorer should. He pounces on rebounds quickly, has good puck skills in and around the net and can make opposing teams pay instantly with his quick release. Despite not winning a game, the Eastern Ontario Wild had a good tournament as they were in every game they played but in the end, their division was just too stacked. Sabourin was one of the single reasons that the Wild were able to remain competitive throughout the week. He is extremely confident and plays a simple game between the pipes. His poise and blocking style really portrayed a calming influence throughout the Wild lineup and the team played a stronger game in front of him as a result. Much like the rest of his teammates, Plante was not able to register many points but he was one of the more noticeable forwards on Eastern Ontario. He showed the ability to beat defenders one-on-one by using his reach and feet to break wide and then drive the net with authority. Plante is a potential late round selection for the upcoming draft and with the chance to play with some skilled forwards at the next level he could blossom into a good complementary winger. McFarlane was the Wild’s leading scorer with a whopping two goals but he was the team’s go-to skater when scoring was needed. He was especially noticeable on the powerplay with his ability to slow the pace down and create scoring chances using his vision and strong playmaking skills. Travis Konecny was the reason many people travelled to the Hershey Centre for the week. 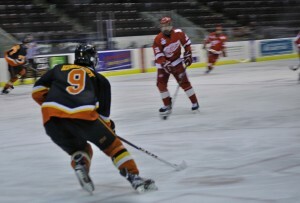 Arguably the top rated skater in the 2013 OHL draft class, Konecny is a dynamic and exciting player that packs a deadly combination of skills featuring elite skating, a pro-shot and the physical aggressiveness to satisfy all types of hockey fans. His ability to elevate his game instantly projects him as a future OHL star and he left the entire arena speechless with his creativity and a shot that cannot be seen by the human eye at times (truthfully). The Ottawa 67’s hold the first overall pick in the draft and it is no secret that the team is itching to draft Konecny as the future face of their franchise. Konecny finished second in tournament scoring with three goals and 11 points as he led his Elgin-Middlesex Chiefs to a perfect 4-0-0 record in round robin play, only to be upset in the quarter finals by the Toronto Marlboros in a 1-0 contest. Crouse started the OHL Cup slowly but came around as round robin play picked up. 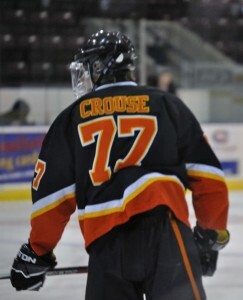 Crouse has quickly become one of the most improved players in the entire province throughout his draft year and his package of size, skill, and physicality will surely get his name called at the top of the draft come early April. Crouse packs a heavy accurate shot and he was quite noticeable in his physical play as opponents took countless runs at him, only for him to sit them down quickly on their behinds. Mayo is the Chiefs’ go-to offensive defensive as his wheels and puck transitioning skills allow him to move the puck quickly to a number of dangerous forwards that Elgin-Middlesex ices. His stick skills are very good allowing him to knock pucks out of mid-air and take passes flawlessly on his both his forehand and backhand. At the next level, Mayo projects as a mobile puck rushing defenseman with excellent abilities to quarterback a powerplay and he should be a second or third round selection. The younger brother of former London Knight Jake Worrad, Drew is a natural scorer that can be trusted in all situations. He excels in front of the net and quickly buries loose pucks into the back mesh. Worrad isn’t the quickest or most agile skater but he takes good routes and closes off ice quickly using good positioning in the defensive zone. In my opinion, Justin Fazio was the one goaltender at the OHL Cup who looked as though he could transition into the OHL as a franchise starter. Between the pipes, Fazio emits confidence and poise snagging up every puck quickly and his rapid reflexes and quick feet allow him to cover the bottom halve of the net exceptionally well. After a tremendous OHL Cup debut last season as an underager to lead Elite Hockey in scoring, Bracco returned with more eyes peeled to his elite offensive skill and spectators walked away both extremely satisfied yet still disappointed. The disappointment comes only because Jeremy Bracco has already committed to Harvard University and will not be coming to the OHL. Bracco was a top three offensive talent at the OHL Cup as his ability to find open space and sneak behind defenders to land a clear-cut breakaway was unmatched in Mississauga. His unique heel-to-heel skating style that witnessed him circle the offensive zone shift after shift only to pull in opposing defenders and then feed a wide open teammate was odd, yet extremely effective at the same time. Bracco excels at timing his offensive attacks as he has perfected skating into a scoring area to receive a pass only to quickly fire the puck into the open net. Bracco will likely be drafted in the upcoming OHL Draft as a “wild card” pick and that team will maintain hope that they can lure this rare offensive talent to the Ontario Hockey League. Held pointless through four games, Donovan Ott made his presence felt through his relentless physical play. A big, powerful forward, Ott is a smooth skating forward that moves well given his size and really excels in puck battles as he uses his large frame efficiently. He displays questionably hockey sense at times and is prone to making bad passes but his size, physicality and nastiness will be an attractive package to one of the twenty OHL franchises. Ott has committed to the University of New Hampshire so his draft stock could see a fall as a result. In my opinion, Elite Hockey’s McAvoy was one of the top defensemen of the OHL Cup. He is a mobile blue liner that enjoys rushing the puck and with his advanced puck skills he is able to make difficult passes look easy. McAvoy showed good physicality and his one-on-one gap control was especially impressive as he logged huge minutes for the Elite Hockey Group. An effortless skater with a unique wide skating style, Matthew Kreis creates his offensive chances with his agile and quick feet. He excels at driving wide on his opponents and cutting hard to the net to unleash his quick shot. Kreis competes hard and the Halton Hurricanes leaned heavily on him as they advanced to the quarter finals after entering the tournament as an underdog squad. At the next level, Kreis appears as though he could find himself in a top-six scoring role with the versatility to play on all special team units. Not an overly flashy player, Mercer excels playing a simple and direct defensive game. At 6-foot-3, Mercer owns a promising frame for a shutdown defender at the next level. He is a good skater who takes smart routes and his low-panic threshold is a quality that cannot be taught. Mercer appears to have good offensive skills as he exhibits a good first pass and the feet to skate himself out of trouble but his calling at the next level will likely be as a more defensive defenseman. The “Klack Attack” was the player Halton called upon when they needed a big play. Klack raised his level of play during critical times as he scored some big goals and showed excellent defensive commitment to block shots during a crucial 5-on-3 penalty kill late in round robin play. His impressive compete level and attention to detail are just two promising qualities that scouts jotted down in their notebooks last week. Look for Part II of “Inside the Scouting Notebook: OHL Cup” that will feature standout players from Mississauga Rebels, NOHA Stars, Ottawa Senators, Southern Tier Admirals, Thunder Bay Kings, Toronto Jr. Canadiens and Toronto Red Wings. Part III of “Inside the Scouting Notebook: OHL Cup” will feature standout players from TPH Thunder, Waterloo Wolves, Whitby Wildcats, York Simcoe Express, Toronto Marlboros and the 2013 OHL Cup Champions, Oakville Rangers. Please follow @RossyYoungblood for your #OHLDraft news.